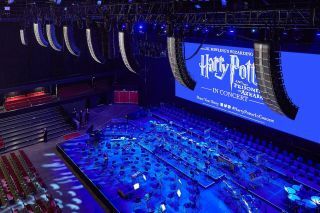 This November, the Adelaide Symphony Orchestra, in partnership with CineConcerts and Warner Bros. Consumer Products, performed Harry Potter and the Prisoner of Azkaban in Concert at the Adelaide Entertainment Centre, South Australia. It was the first use of L-Acoustics L-ISA Hyperreal Sound in the southern hemisphere and took audiences even deeper into the magical world while the symphony orchestra performed the entire score live to picture. L-ISA was deployed by leading Australian technical production company Novatech, which has been using L-Acoustic systems for events of all sizes and scope around Australia, from music festivals to live concerts and corporate events, for over a decade. A keen innovator and early adopter of creative event technology, the company has always endeavored to improve the experience for guests and artists alike and has invested heavily into new technology over the years. When L-ISA was released, Novatech looked for opportunities to use the groundbreaking technology in Australia. The search quickly focused onto one of its longtime partners, the Adelaide Symphony Orchestra, which has gained a reputation for outstanding contribution to the world of music and, with the nature of the entertainment perfectly matching the application of L-ISA, was a natural fit. The L-ISA setup included 126 input channels and 96 L-ISA objects and used an L-ISA Wide design solution, deploying a total of 84 L-Acoustics Kara cabinets in seven hangs of 12 Kara, each spaced above the performing zone to provide source separation and localization, two extension speaker groups of 12 Kiva II and two flown subwoofer arrays of four SB28 in an end-fire configuration in the center. The monitor system comprised 10 X15 HiQ cabinets and eight X8. Control was via a DiGiCo SD10 mixing console at front of house and an AVID S6L at monitors, connected via three Optocore optical loops. Charles Gagnon, who mixed the show, made adjustments to the soundscape using the L-ISA Controller software to address the processor and create the soundscape for static information such as object panning, source width, distance, etc., based on input channels bused from the SD10.